Do you remember a week ago or so when I talked about CSN stores? They had contacted me and wanted me to try one of their products for free! How generous is that? 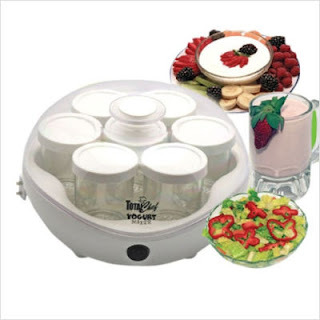 After spending literally hours trying to decide what to get, I finally decided on this Yogurt Maker! Making your own yogurt is healthier and more cost effective than buying it. And, you can make whatever flavors you wish! I was pleasantly surprised that my shipment came quickly, and the product was just as good as advertised. The yogurt was easy to make- just heat some milk, add some pre-made yogurt, put it in those little cups and let the machine do it's job! What came out of those little cups was smooth, creamy yogurt! The bonus was that each person in my family could take their own cup, and add whatever they wanted to the plain yogurt. One had strawberries, one added granola, and my "vanilla" son just had a touch of honey. I am excited about the service that CSN provided, and will be shopping there again soon. **I did receive a free product to review for this post, but my opinion is my own. I've been wanting to buy one of these sets too! I made homemade yogurt in a thermos and it was wonderful. But the thurmos is hard to clean and doesn't yield much. Now I want a yogurt machine! Thanks for the review.